Recognize the classic look of hematologic diseases and quickly confirm your diagnoses with Hematopathology: A Volume in the High Yield Pathology Series. A templated format, excellent color photographs, authoritative content, and online access make this an ideal reference for busy pathologists. Among the numerous features that set this apart from many of the other quick references for hematopathology is the expansive benign section that includes reactive lymphadenopathies, reactive histiocytic disorders, and red cell disorders. Each topic is covered in just 1-to-2 pages with clinical features, histological findings, differential diagnosis, and correlating ancillary testing (i.e. immunopathology, molecular testing, and hemoglobin electrophoresis). In addition to the top-quality images and easy-to-follow bulleted text, the book includes access to the Expert Consult website. This is a great addition to the High-Yield Pathology series. With high-quality images, a broad spectrum of benign and malignant hematologic conditions, information on ancillary testing, and an easy-to-follow layout makes this a perfect quick reference for busy pathologists." - Jamie Boone, D.O. (University of Kansas Medical Center) Doody 4 star rating! 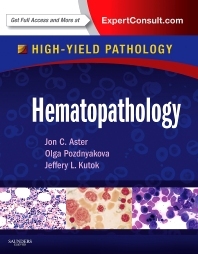 "Hematopathology...comes from the the 'High Yield Pathology' series. As such. it's style is very much a bullet-point list of key facts and information, alongside numerous high quality cytological and histological photographs, and printed on glossy good quality paper stock... This book is a useful overview for confirming suspected diagnoses, and to help guide further testing."